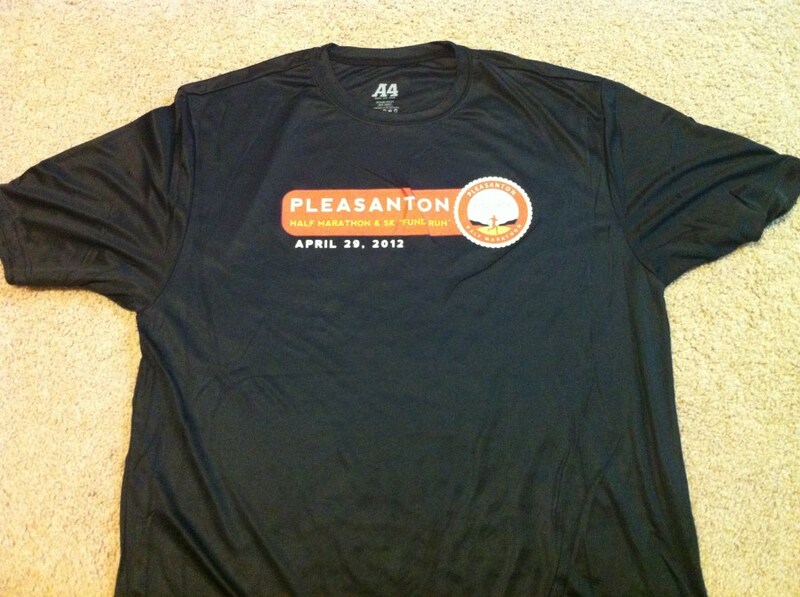 We ran in the inaugural Pleasanton Half Marathon. There was also a 5k. Start and finish were at the Pleasanton Sports Park although they were actually .75 miles apart. 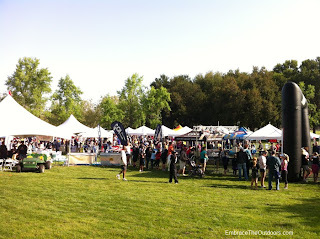 The event was put on by South Valley Endurance. This was our first race put on by SVE and we were impressed. It was very well organized and there were more people than we had anticipated for an inaugural event-1532 participants in the half marathon and 542 in the 5k. It was the first race in a series of three races-all part of the CA Running Series. Early bib pick up was at a local running store. Same day pickup was available for an additional $10-this is the first time we had seen an additional fee at a local race for same day pick up. We went the day before the race to pick up our bibs. There were a lot of people at the store but it was not chaotic. Bibs were picked up inside the store and a re-usable bag and race shirt were picked up outside. The shirts were technical fabric which we always prefer over cotton, and they were black in color which is rare. We realized we were fairly close to the race start/finish so we drove by. It proved to be helpful because we got a preview of where the finish line was going to be and even the parking lay out. On race day we parked in one of the parks lots about halfway between the start and finish. We made our way to the start, looking for our friends that were running it as well. They had a little trouble with parking so they got to the race start just a few minutes before the start, which was right on time. We ran along the parks parking lots before making a u-turn on the residential street that was parallel. It was nice to be able to see other racers on this switchback. It wasn't long before we were on a fire road that we ran on for a few miles. Some of it was paved, some was gravel. We were warned of there being a few miles of gravel in the course in the pre-race email. It was on to residential and city streets for a few miles before heading back onto the fire road. 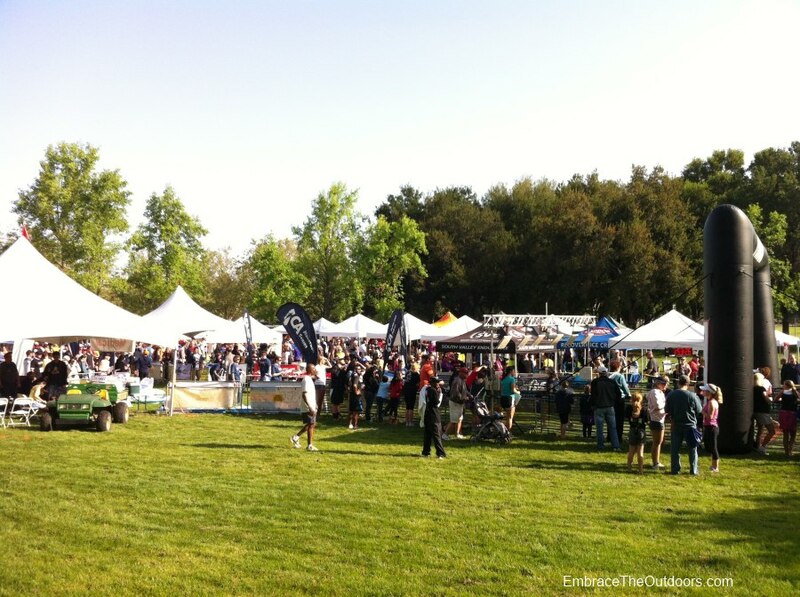 There were several aid stations along the course with water and sports drink but no gels. At about mile 12 the course was back in the park on the concrete walkway. There were more spectators here and we could hear the cheering, this is always motivating. Coming across the finish line there were already a lot of people enjoying the post race goodies since the 5k participants had already come through. Past the finish line were race medals, cold water and towels soaked in cold water. It was a warm day but not hot, still the wet towels felt great. There were several booths set up, the largest had the free food for participants which included some tasty burritos and fruit. A stop at the coconut water booth was a must. There were a lot of sponsor booths too with gear and food for sale. One of the great things about this race was that we could check our finish time online soon after crossing. There was an option to have your time texted to you as well and they had a live camera at the finish that could be watched online. For an inaugural event it was very well organized and we had a great time. We would definitely do this race again, or maybe another SVE event. We ran the Santa Cruz Half Marathon for the second time. We first ran it in 2010. 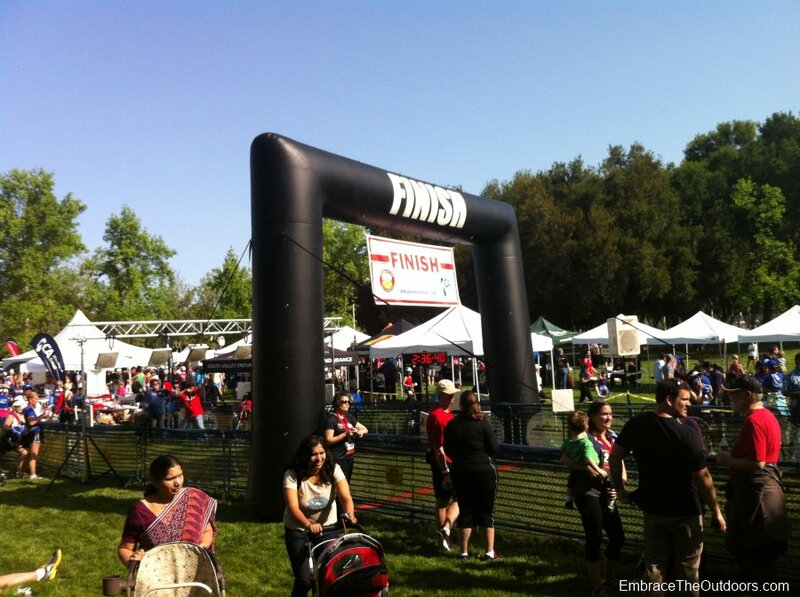 This year there were nearly 4000 runners that participated. There was a half marathon and a 10k. We picked up our race packet at a local running store two days before but had to wait for the finish before getting our shirts. Two years prior it had been cold and windy with rain welcoming us at the finish. This year it looked like it might be the same or worse. We camped at the nearby New Brighton State Beach the two nights before the race and saw rain on and off during that time. Surprisingly on race morning the sky was clear and there was no rain in sight. We packed up all of our gear and made the 20 minute drive to the race. The start was only a few blocks away from the Boardwalk as it had been in the past so we knew to leave extra time to navigate through the traffic and find parking. We parked in the designated lot for the Boardwalk, paying $12. We made our way towards the start just a short walk away. Although it was a little cold being by the coast, the sun was out and we were hopeful that the rain would stay away. As we approached the start we saw masses of people standing in lines and then realized that they were waiting for porta potties. Unfortunately the porta potties had been placed along the block leading to the start so it was really congested. We waited our turn then tried to get as close to the start line as possible but there were just too many people and there was no organization. Glad it was chip timed. As in years past, the course started out on a street along the coast. The street was wide but with the unorganized start it took a while to maneuver around slower people that started ahead of us and walkers. After a couple of miles it quickly narrowed and stayed that way for most of the course. 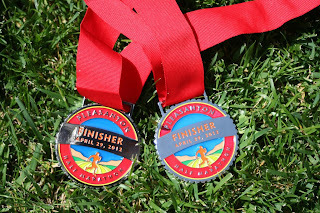 The course had a few rolling hills and was mainly an out and back route with one loop in Wilder Ranch State Park. Once in Wilder Ranch the paved road was replaced by gravel and dirt and we had to be careful not to twist an ankle. The dirt path through the park was the narrowest part of the course making it difficult to pass other runners. There were also several large puddles on the trail since it had rained so much the days before. We could definitely feel the wind when running close to the coast but the views were spectacular. Once out of Wilder Ranch we re-traced our steps back towards the Boardwalk. Back on the wide street it seemed that it was open to car traffic but there weren't signs or volunteers directing us out of the street so we continued on the street itself. The finish seemed very abrupt as we made a sharp right turn only a few steps from the finish line which is on the beach itself. Having the finish line on the beach is nice in theory but caused us to get sand in our shoes and socks and slowed us down. Once at the finish we received our medals and then picked up our shirts. The race shirt is made of technical fabric which we like much more than the typical regular cotton shirts so it was a pleasant surprise when we picked them up. Water and sports drinks were handed out at the finish line and booths were set up on the beach with food including bagels, granola bars and fruit. Although the ocean breeze kept the area cool, the sun was out the entire time, we didn't get one drop of rain during the race. The course and views are nice but organization at the start could be improved.